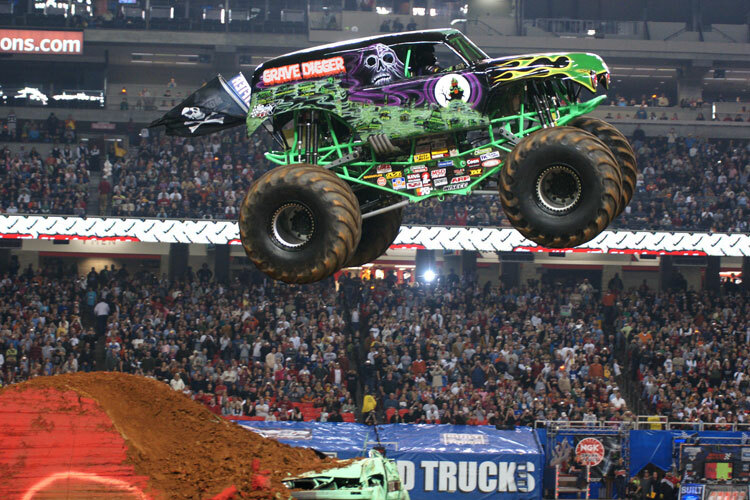 Grab your John Deer hat, your tightest fitting “wife beater”, and stuff a tin of Skoal Bandit in your back pocket because this SUNDAY, SUNDAY, SUNDAY you are in for some Monster Truck Madness. Watch 1500 horses and ten-thousand pounds of thunderous monster truck crush mountains of cars and fly over 30 feet in the air…. I know what you are thinking. If you have ever purchased stock, actually have medical insurance for your family, or have a home that is always parked in the same place, you probably don’t have any business at a monster truck rally and/or tractor pull. Cliché’s be damned, my little guy loves monster trucks so I bought front row tickets and pit passes to Monster Jam and off we went. If you have read many of my reviews, you know that I am recovering white trash. I have dirt ball roots that run deep, but I fight it at every corner. This ticket purchase probably negated any progress that I have made since my mullet hit the barbershop floor, but if it makes my son smile, it is worth it. The things we do for our kids. As for the event, a word to the wise, arriving early to take advantage of the pit passes is a must. I live in a NASCAR friendly town, so this place was packed from get-go. We walked down to the center arena and found all of the trucks parked with the drivers out front taking pictures and giving autographs. This was definitely the most memorable part of the day. My son was able to stand right in front of the trucks, talk to the drivers, and have them autograph his official $10 program and then get pictures. The lines were pretty long and we never did get through to meet the driver of “Gravedigger”, but my son had a blast. The driver of Metal Mulisha was particularly chatty with my son, so that truck became his new favorite for that day, and every day since, as a matter of fact. After we got kicked out of the pit, we headed back to the souvenir stand to kill some time and drop some cash before the show. I was amazed at the lines here too. People that obviously couldn’t afford a dental plan or shoes with laces were spending hundreds of dollars on Monster Mutt hats and rally flags. I think I dropped another $30 on swag before we headed back to our seats. ( but I have dental insurance, which means I am not a hypocrite.) We did bring ear plugs, but at first, the noise was so ridiculous that I thought my son was going to freak and we would have to leave without seeing the show. He acclimated and accepted the doubtless hearing loss within about 10 min. and was cheering for his favorite trucks from then on. I have to say, the trucks really were amazing. We were on the first row right in front of a stack of cars and I was a little worried that we would actually be hit by debris. We were showered with dirt a few times but, indeed, escaped the “flying wheel” and “metal shard death” that kept cropping up in my head after seeing 3 Final Destination movies. Long story short, we both loved the show and had a great time. I barely noticed the freakish crowd. The highlight of the show was the “Freestyle” round where the drivers just went nuts on the course for a few minutes each. Massive air was achieved and after 3 roll-overs, it was apparent that they weren’t babying their million-dollar machines at all. Mad air and crunched cars abound. 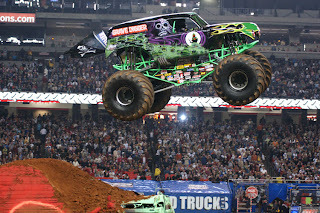 Since the show, my son has talked about monster trucks almost every day. He asks to play monster truck video games and asks me to look up trucks on the internet. He pours over the pages of his program and talks about the autographs and photos he has with the drivers. I just may be up for Father of the Year. Sometimes you have got to look past the stereotypical mayonnaise sandwich eating, Carhartt wearing, tube-topped, mountain trash that seem to flock to these types of events and just go and enjoy yourselves. We sure did. This time with my son definitely gets 5 stars.